Do you know how you feel when you get a new garden, or kitchen tool, and you love it so much you just have to tell everybody? That’s what today’s episode is ALL about! 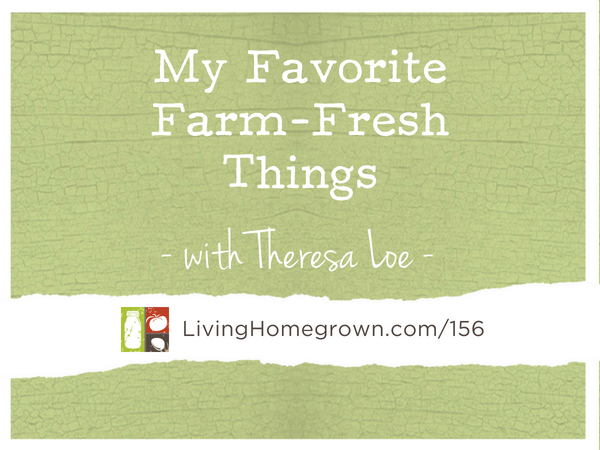 I’m sharing my favorite things that make farm-fresh living easier. This isn’t one of those sponsored episodes where all the products I talk about were sent to me for free in exchange for an endorsement. Everything I’m sharing with you today was paid for with my own money, and I’ve used them for years. I just want to share them because some of these things you may not have heard of yet. And I really enjoy using them around my garden, in my kitchen, and at my farmstead. I would love to hear about some of your favorite farm-fresh things. After you listen, tell me about them below in the comments, or over on my new Instagram account that’s just for @LivingHomegrown. Download the pdf with the descriptions and links for ALL the farm-fresh things discussed in this episode. Good grief! I had no idea you had an Instagram account. I have just found it and love it. Already found a quote that means a lot to me. I will truly enjoy checking in on both of your accounts. Enjoyed your favortie products. I think I am going to order a pair of those gloves. I’m so glad you liked the episode AND that you found my IG account. 🙂 Thank you! Trees of Antiquity, here in CA, have great heirloom trees of all kinds and sizes from as far back as the 1500s. I got a Spitzenberg from them, which was supposed to be Thomas Jefferson’s favorite Apple. I have also grown peach, plum and apple trees from seed. The plum was a wild one that tasted like a Satsuma and bred true. The peaches and apples didn’t breed true but are vigorous so I’m going to use them as rootstock for grafting. I’ve also grafted a Suncrest Peach scion to a plum rootstock that I bought from One Green World in Portland OR. Trees of Antiquity is a fantastic source. I should have listed them too. We discovered a Spitzenberg apple on our Farmstead (Luckily it was labeled) and it is my son’s favorite apple. So crisp and delicious! I’ve never had a Suncrest Peach – but the fact that you grafted one sounds so fun! I have not yet tasted the Suncrest Peach (I only grafted it last year). I was so intrigued by its description in David Masumoto’s book, Epitaph for a Peach, that when I had a chance to get a scion, I just had to have it. Oh Wow Harriette. How cool is that?